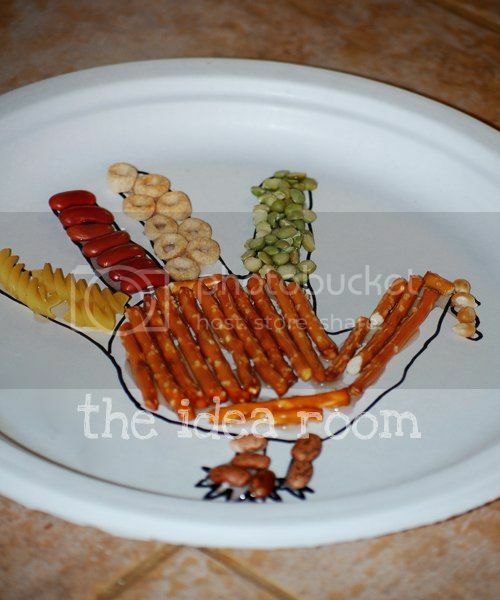 Need something fun for and entertaining for the kids while they wait for Thanksgiving dinner? 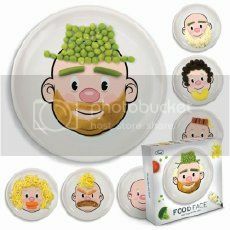 Encourage them to play with their food on these fun food face plates. 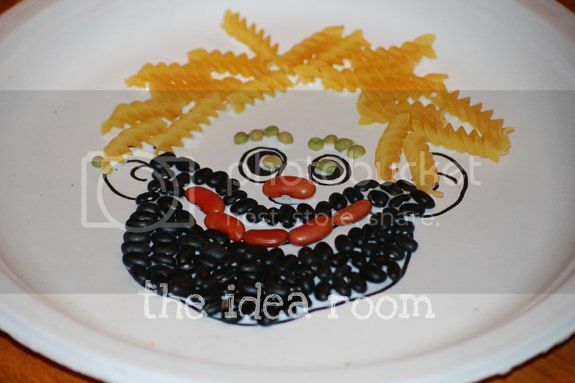 I have seen these Food Face Plates around and have always thought it would be fun to make faces with your food. So instead of spending $9.95 on some, we made our own by drawing a face with Sharpies on paper plates. We gathered up a variety of food to decorate them with. 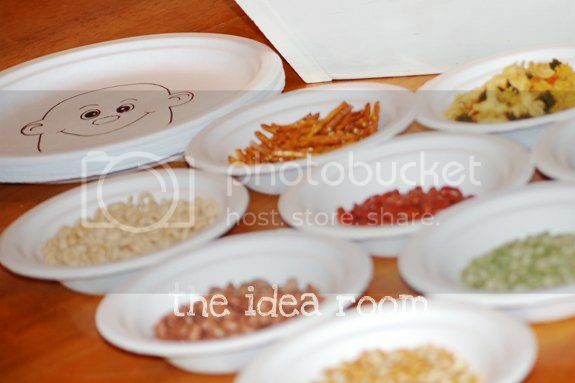 For example, noodles, dry pinto beans, kidney and black beans, split peas, pretzel sticks and cheerios. Then we let the kids design and decorate to their liking. I thought the older kids would get fairly bored, but they actually made a couple of different faces. We used regular Elmer’s white school glue and it worked great to hold everything in place if the kids want to save their faces, or don’t glue them and let the kids experiment with different faces. When finished, they just slide the food pieces off and start over again. Then we decided to trace the kids hands and they each made a turkey. Now I know this is not exactly a new and brilliant idea, but it might be something that you can use to entertain the kids when Thanksgiving rolls around. Especially if you have a lot to get prepared for your Thanksgiving feast or a house to clean before company comes….Just don’t clean the kitchen floor until AFTER the kids are finished decorating their faces! 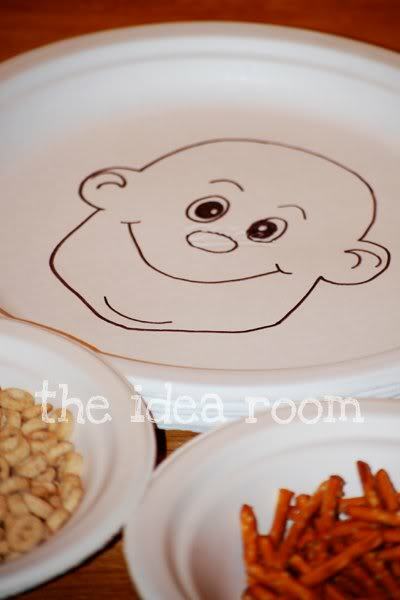 And in the spirit of giving, you can click here to download our Food Face to trace onto your own paper plates. LOVE this idea, Amy! 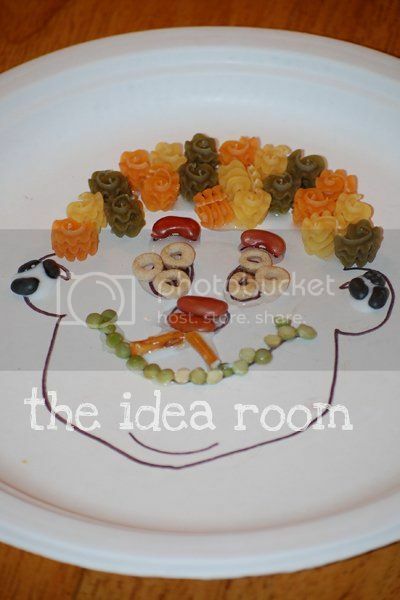 It may get my daughter to eat more if she needs a particular food to dress up her "face":) Thanks for the download. So fun! My kids will love this! Thanks Amy! Thanks! This will be so awesome! For our dinner this year, we have been asked to do a 15 minute activity with all of the cousins…15 of them! This will be perfect! What a great idea!! My kids would LOVE this. I think I'll have to print some off and give it a try. I'm all for anything that buys me a few moments of peace. What a great idea! 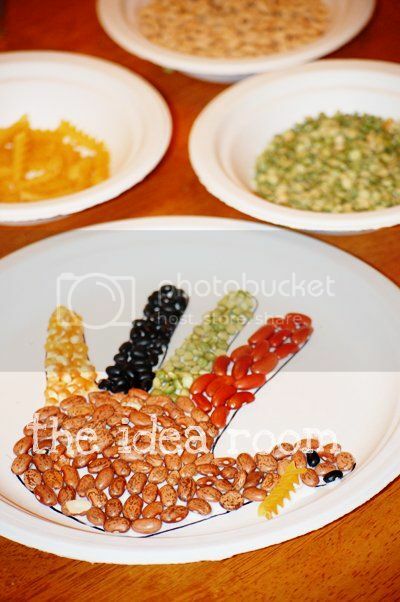 We'll be with the Kjars this year for Turkey Day and I know the little kidlets will love this! And I'm going to forward the post to my family :) I forwarded the post about "Don't Eat Frank" last month and a couple of my sisters used it for their kids' parties at home and at school, and they said the kids had a blast! 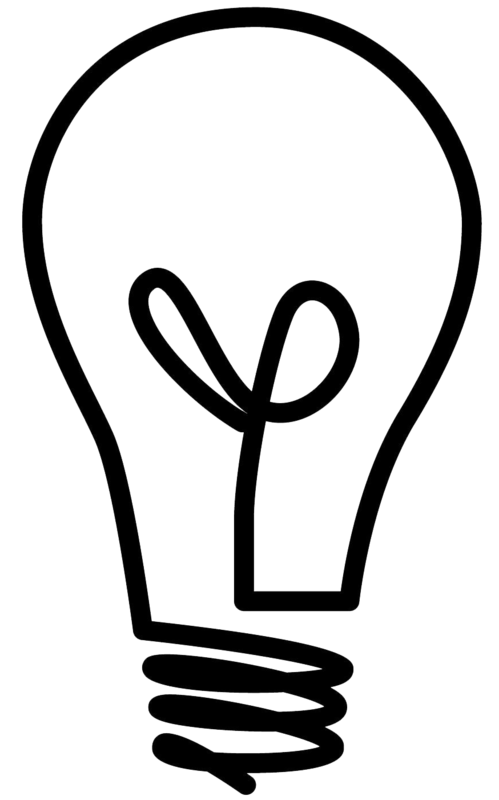 Keep the creative and fun ideas comin'! Love it Amy! And the turkeys are great too! 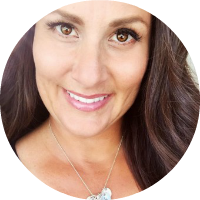 Sharing this with my Facebook readers! How great.. I always see things like that plate and love them..but dont event think I could make it myself.. genius.. and i love the turkey! What a funny and smart idea! Thank you! How clever is that!! Love it. What a simple but fun craft. My 4 yo would go goofy over that. I will have to try that out! Love this idea! I’ve been wanting the food face plates for several years now but didn’t want to pay $10+ per plate (we are a family of 6). I’m going to use this idea for all the kids that are coming for Easter lunch! I’m going to trace the face on the under side of clear plates. That way they can use their lunch food to decorate him but still be able to eat without the ink smearing from the juicy food. Thanks so much for this! I’m so excited! 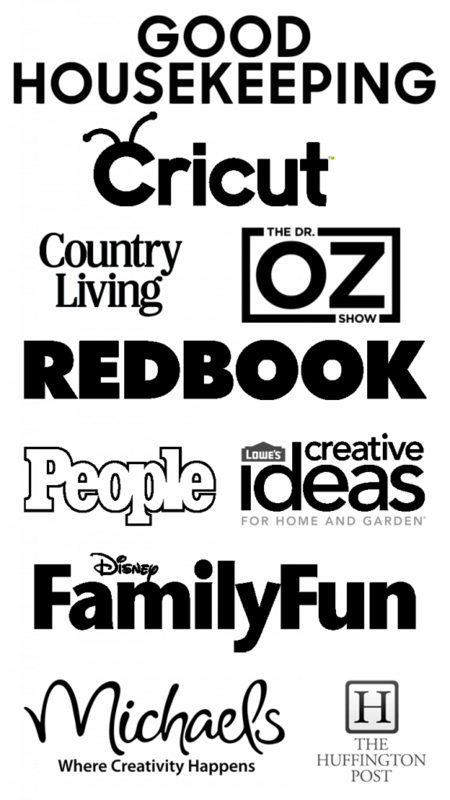 I can’t get the image when I click on the link. It goes to a black page on Scribd. Just an FYI.. Uncooked kidney beans are poisonous. Please do not use them with your little ones.